Surprise! Thousands of cicadas in the D.C. area are popping out of the ground after unexpectedly hatching off-schedule, experts say. 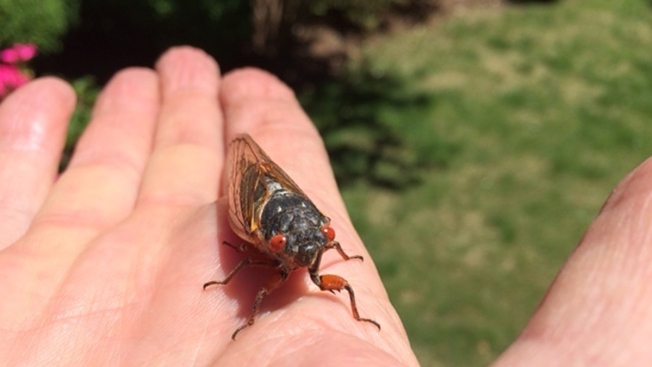 The emergence of the cicadas -- which are large and noisy but harmless to humans -- have surprised experts as they've hatched earlier than the usual time of late May and before their cycles of 13 and 17 years. Scientists are working now to determine what brood the bugs belong to and why they are hatching sooner. University of Maryland entomologist Mike Raupp, who also maintains the website Bug of the Week, said experts aren't sure why off-schedule hatching happens, but it's been documented several times prior. He says the phenomenon is known to occur in Brood X, which is expected to appear next in 2021. The D.C. area last saw a massive arrival of Brood X cicadas in 2004, although some hatched early in 2000. The cicadas could also be from Brood VI, now appearing in parts of Georgia and the Carolinas. Do you have cicada images to share? Tweet yours @nbcwashington or email them to isee@nbcwashington.com.